First of all, Dean Bosworth - once again - thank you very much for your kind invitation. Once again it is my great pleasure to attend a Fletcher symposium. And I am delighted to discuss with you Asia and the World: The Evolving Context. But first of all: what is Asia? At the turn of the century, the bolder predictions had it that the 21st century would be a 'century of China', while the more cautious talked about an 'Asian century'. The first is the global level, looking at Asia's place in the world. In history, for almost all of the past three millennia, Asia has enjoyed a leading role in human progress. The fast development of Asia during the past three decades is returning the region to its long held position of strength. This is the trend of our world in this century, and it matters a lot to the world. Asia's recent rising standing in the world is first and foremost reflected in its growing share in the world economy. An Asian Development Bank report in May shows that the GDP of Asia accounts for 27% of the world's total. That is an increase of 10 percentage points over the 1950s. This is higher than the EU's 26% and the US 24%. The recent global financial crisis has had variable impact on different regions. We have seen robust growth in Asia. There has been a slow recovery in the United States and the EU and sluggish international demand. Most notably, growth in Asia has driven world economic recovery in 2009 and 2010. This was most notable in 2010 when Asia contributed more than 45% of world growth. The IMF Regional Economic Outlook: Asia and Pacific released this April estimated an average growth of nearly 7 percent in Asia in both 2011 and 2012. This has reaffirmed Asia's status as the fastest growing region in the world. This trend will continue according to IMF estimates published in 2010. Driven by strong growth in China and India, the Asian economy was expected to grow by 50% during the next 5 years. The IMF projects that by 2030 Asia may overtake the G7 as the largest economic region in the world. Asia's economic development is also matched by its growing international influence. The 2010 IMF quota reform plan will increase the Asian quota by more than five percentage points to 22.5%. The G6 started as forum in 1975 for discussion of world financial issues. The members were the USA, UK, Germany, France, Italy and Japan. Canada joined in 1976 and Russia in 1997, expanding the group into the G8. The changing world order created the G20. By 2009 the G20 group of nations eclipsed the G8 as a leading forum for economic co-operation and global economic governance. Five members are from Asia: one advanced economy - Japan, plus four emerging economies - China, India, the Republic of Korea and Indonesia. That list does not include other G20 Asia members. For example, the West Asian Saudi Arabia and the Euroasia Russia and Turkey! It was hard to name a renowned forum on world affairs in Asia a decade ago. Today the Boao Forum for Asia has become one of the most influential economic forums in the world. It has a unique 'Eastern Hemisphere perspective' analysing the development of Asia and the world. The Boao Forum provides a valuable balance to the "Western Hemisphere perspective" of the World Economic Forum in Davos, which is just a couple of hours' drive from here. Both the Boao Forum and the Davos Forum are reaching to other parts of the world. There is now a 'Summer Davos' which rotates between Dalian and Tianjin in China. This year the Boao Forum will host events in Perth, Australia and again in Paris, France. I have touched on the growing economic and international influence of Asia. Asia's development can also be seen through the greater influence of its culture and way of development. Japan was credited as the most competitive economy in the 1970s and 80s. Its model of manufacturing, such as 'just in time' deliveries, was followed by many countries. History shows how Chinese inventions and ideas have had a profound influence on the world. The system of government officials selected by examination came from China. In China the roots of this system go back 2,000 years. In the past two centuries this system of meritocratic governance has profoundly influenced the evolution of governments in Europe. In Britain, senior government officials are called 'Mandarins' reflecting this historical link of Chinese influence of ideas. As China develops in the 21st century, I believe its ideas will increasingly be understood and appreciated, for example, its commitment to peaceful development and aspiration to build a harmonious society at home and a harmonious world. Traditional Chinese culture such as Confucianism and Taoism are inspiring people. You will see people use more phrases originating from Chinese wisdom. For instance "Work together like passengers on the same boat", and "Cross the river by feeling for the stones". There are estimates of over 40 million foreigners learning mandarin today. In just six years, more than 300 Confucius Institutes have been opened worldwide. Asia has transformed from a marginalized, almost voiceless region. Asia now shows remarkable achievement, significant influence and a louder and clearer voice. Let me turn to the second level - the regional level. From this level let us take a closer look at the opportunities and challenges facing the region. On the opportunity side, Asia is blessed with plenty of them. Firstly, there has been an era of lasting peace. This is especially true in the past three decades. The region has been largely stable, without major conflicts among members. The pursuit for peace, stability and cooperation has been a common cause. Secondly, emerging economies in Asia have started upgrading their growth strategies. This will give impetus to development of the region. China and India are doing their best to sustain economic growth. This is being done with policies that boost domestic demand and consumption, enhance their abilities to innovate and improve people's livelihood. Thirdly, Asian countries are advancing progress in cooperation and regional unity. There are many mechanisms for regional cooperation that are working well: ASEAN, China-Japan-ROK, ASEAN plus one (China), ASEAN plus three (China, Japan, ROK) and the East Asia Summit. ASEAN is more than 40 years old. This most successful regional organisation of developing countries is steadily moving towards an ASEAN Community by 2015. Fourthly, thanks to effective regional cooperation, the Asian markets are opening up more quickly. The ASEAN Free Trade Area is developing fast, with some of its members enjoying zero-tariff treatment. The China-ASEAN Free Trade Area was established last year. This embraces a population of 1.9 billion and is larger than any other free trade area in the world. As a result, Asia is beginning to benefit from an integration process comparable to what happened in the EU. There are many positives. But Asia is also confronted with challenging issues. Some from within, others from the outside. Countries in the region vary greatly in levels of development. Asia has the second largest developed country in the world. It has several fast-growing emerging economies. But there are nine least developed countries designated by the UN. The Asian economy suffers structural issues. For example, over-reliance on the international resources markets such as for energy, minerals and food. Countries in the region vary from one another in terms of social systems, religion and culture. Almost every variety of political system can be found here. Crises pop up from time to time - such as nuclear issues in North Korea. These tensions have created an impression of Asian instability, especially in the media in the USA and Europe. The US and some European countries are still experiencing economic difficulties. These gloomy economic prospects outside of Asia are sure to affect growth prospects of the region, for example, in the form of reduced exports which have been an important driver of economic growth for Asia. Rising prices of raw material outside of Asia has brought about imported inflation. The reckless flows of hot money have resulted in overheated investment. There are also 'investment bubbles' in real estate and the internet industries. Perhaps most important of all Asia must constantly be vigilant with supervision of its banking and financial sectors. It is critical to avert the kind of financial crisis that emerged from sub prime mortgages in the US and Europe. I believe that for Asia, opportunities outweigh challenges. The positive driving forces far exceed the negative disruptions. Most of the challenges are merely inevitable 'growing pains' Asia remains a promising land. Turning to the third level - China, the most active player in the region. I elaborated on China's development at the 8th Annual London Symposium of the Fletcher School last year. To put it simply, China's development is peaceful, open and responsible. China's development would not have been possible without the world. In turn a more developed China will play a bigger role in the world. When it comes to Asia, China is a key member of the family. Its close relationship with the rest of Asia is characterised by good neighbourly friendship and win-win progress. China has always given top foreign policy priority to Asia. China has established partnerships of various forms with almost every country in Asia. This has led to deepening mutual understanding and trust. China is committed to resolving territorial and maritime disputes with its neighbours through peaceful and friendly negotiations. China's consistent proposition on the South China Sea is to put aside disputes and go for common development. China is taking an active part in regional security dialogue and cooperation as a responsible player. For example, China's role in maintaining the stability on the Korean Peninsula is particularly constructive and crucial. China's economic cooperation with other Asian countries has produced highly significant results. This has contributed to common development. China is the largest trading partner and export market of many Asian countries. China's trade with other Asian countries stood at 931.6 billion US dollars in 2010, accounting for almost one third of China's total trade. On this trade flow the Chinese deficit was 104 billion US dollars. Through working together, China and its Asian partners weathered the impact of two major economic crises. The first was the Asian financial crisis. The second was the recent international financial crisis. And connectivity through infrastructure development. Asia has become home to the largest number of international Chinese businesses. Direct investment from China to ASEAN has topped 10 billion US dollars, and the figure last year hit 2.57 billion. China supports the Master Plan on ASEAN Connectivity. As a consequence China is committed to development of roads, railways, shipping routes and ports in the region. China is extensively and increasingly involved in regional cooperation. The driving theme is to promote Asia's development through unity and its economic integration. The China-ASEAN Free Trade Area has become a successful example of a free trade area between developing countries. This is enabling more efficient movement of capital, resources, technologies and people. China is an active player in economic cooperation in the Greater Mekong Sub-region and the ASEAN-Mekong Basin Development Cooperation mechanism. The development of a possible East Asia Free Trade Area is making progress. This includes the China-Japan-ROK free trade area which is high on the agenda. China will continue to work with other countries in Asia. The collaboration aims to create a regional political environment that upholds peaceful coexistence among countries, big or small. Cooperation targets an economic environment conducive to prosperity for the whole region. Joint action aims for a security environment that ensures lasting stability. And working together to create a cultural environment that facilitates diversity. This year's Boao Forum for Asia Annual Conference focused on inclusive development. Being inclusive is first of all about being open. China advocates open regional cooperation and it is open to cooperative initiatives and mechanisms of all sorts. I have gained many benefits from my period of study at the Fletcher School (of Law and Diplomacy). One example was the facility to study the 'Monroe Doctrine'. You will know better than me how this had a profound influence on the foreign policy of the United States for over two centuries. So with your understanding of the 'Monroe Doctrine' you will grasp how China does not follow this principle in Asia. China does not see Asia as its 'backyard'. China respects the interests and presence of non-Asian countries in the region. China does not seek to challenge the United States in Asia. As a result China will never force Asian countries to choose between China and the United States. In turn China also hopes that the United States will do more to increase mutual trust, solidarity and cooperation among Asian countries. I believe this is also what the Asian countries aspire for. Cooperation between China and the United States brings about peace and stability to Asia.. Confrontation leads to tensions and conflicts. A stable and nuclear-free Northeast Asia. A prosperous ASEAN and a South Asia free from war or terrorism. These shared goals are exactly why China and the United States should accommodate each other's interests in Asia. Instead of containing each other; China and the United States should increase mutual trust and reduce suspicion. China and the United States should work together instead of competing with each other. China and the United States are partners in Asia, not rivals. Positive progress for Asia was won when President Hu Jintao visited the United States earlier this year. The Joint Statement issued by Presidents Hu and Obama illustrates the progress. China stated in the Joint Statement that it welcomes the United States as an Asia-Pacific nation that contributes to peace, stability and prosperity in the region. Both Presidents agreed to enhance communication and coordination in the Asia-Pacific region in a spirit of mutual respect and cooperation. Another advance was won at the third round of China-US Strategic and Economic Dialogue that was held not long ago. Out of the dialogue came an important decision to start China-US consultations on the Asia-Pacific. This can make a valuable contribution to China-US interactions in Asia. Having looked at these three levels, what is key to Asia's future? Given its complexity, it is obviously a challenge for me to come up with a simple satisfactory answer. But let me try with a metaphor. Four-wheel drive vehicles have long been popular. The reason is they are rugged, robust and reliable. It is no surprise these qualities have become popular. It has led to many versions of SUVs or Sport Utility Vehicles. Similarly, Asia's development depends on four wheels that working together must prove to be rugged, robust and reliable as well. The first wheel would be a leader. This is not just China, but also India, Japan and ASEAN. Their growth will have a spill-over effect on others of the region. The second wheel is economic integration. The EU provides plenty examples of the benefits and challenges. Over a period of five decades the EU has evolved from a free trade area, to an economic community and to a currency union. Asia can learn from the positives and negatives of EU evolution. Asia should observe how the EU grew by taking the easier steps first and moving later to resolving the thornier issues. The third wheel is mutual trust on the political and security fronts. Asia needs to learn the lessons from history. It needs to strengthen its 'safety valve' to cope with crisis. For example, building mechanisms to defuse crisis that could trigger tensions among countries in the region. The fourth wheel is social stability. Economic underdevelopment of Asia over the years has been rooted in colonialism and years of war and social unrest. These have deprived the region of opportunities to develop. Asia must prevent such tragedy from happening again. Asia must seize the opportunities presented by our time to ensure a stable society and deliver better lives for all its people. There is great hope for Asia, if all of these 'four wheels' work smoothly together. In this way Asia will defy all challenges. The 'four wheels' will lead the drive towards progress and prosperity while maintaining a proper balance and stability. Some say Asia originally means 'where the sun rises'. Today Asia is rising in the east. That rise is linked with the hope to bring wellbeing to people in Asia. The rise of Asia is joined with the wish to inject vitality to the development and prosperity of our whole world. 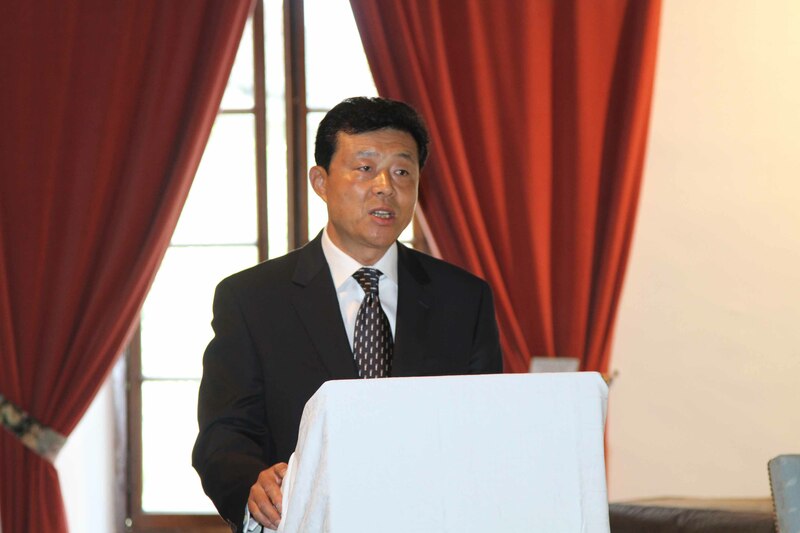 This keynote speech was delivered by Ambassador Liu at the 10th annual <?xml:namespace prefix = st1 ns = "urn:schemas-microsoft-com:office:smarttags" />Talloires symposium of the Fletcher School of Law and Diplomacy of Tufts University on 4th June as a Fletcher alumni. The symposium was hosted by Stephen Bosworth, Dean of the Fletcher School and the US Special Representative for North Korea Policy. Nearly 100 people were present, among them officials from WTO, WHO, UNICEF, the World Bank and the World Economic Forum, diplomats based in Europe and European and American business and political leaders. Following the speech, Ambassador Liu answered questions on China-UK relations, China-India relations, the RMB exchange rate, the Korean nuclear issue, the Iranian nuclear issue, the WTO Doha round negotiations, situation in West Asia and North Africa, the Middle East peace process, the UN Security Council reform, China's international assistance and the issue of South China Sea. Established in 1933, the Fletcher School is the longest-existing graduate school of international relations in the United States. It has alumni in 130 countries working for governments, international organisations, businesses, media and academic institutions. This symposium was the 10th symposium Fletcher holds annually in Talloires.